TrackMania is an arcade racing series for the PC created by Nadeo. TrackMania is a fast paced racer with jumps, loops and stunts with unique handling cars through unique environments. The series has an easy to use track editor to make custom tracks with as well as various cosmetic mods which has led to a huge community even a decade after the release of the original game. Since the first game released in 2003 there have been eight PC titles of the series. The first game of the series released in 2003, TrackMania contains three environments: Desert, Rally and Alpine and all have their own themed pieces for each. Desert is an environment set in the American desert with muscle cars that have overly stiff suspensions and accelerate fast but will often drive on two wheels in order to corner. This environment has loops, banked roads, jumps and other pieces themed to American roads. Rally takes place in a European countryside with small hatchbacks skidding and sliding around small towns and castle walls. This environment does not have loops or other crazy block pieces available for it. Lastly, Alpine takes place somewhere in the Asian arctic where grippy trucks drive their way across wooden roads around pagodas, sliding on ice and driving through snow. This environment has many loops and tubes available for use in making crazy tracks. TrackMania: Original is a re-release of TrackMania with more blocks and the Sunrise graphics engine and was a free update to TrackMania owners. The second of the series, this game released in 2005 and comes with three new environments: Bay, Coast and Island with improved shading and a /mu/ tier soundtrack all with new blocks, vehicles and handling types. Bay takes place off the side of a coastal city on an island with fast SUVs going through an urban jungle as they race across rooftops and on highways. This environment makes the most use of platform blocks and banked platforms in its tracks. Coast takes place on a Mediterranean island with cars resembling Mercedes SLRs with this environment is the most closest of the entire series to a simcade and contains many blocks that could be used to make a racetrack with. It is also the environment used for drift series. Island is the last environment included with Sunrise and has high end supercars with the fastest speeds of any TrackMania vehicle racing around a Caribbean island and contains the most types of blocks available to make some insane tracks with. Originally released for a promotion for the Electronic Sports World Cup back in 2006, Nations contains one new environment: Stadium. This environment takes place in a large stadium where F1 cars drive around tracks with blocks similar to Island. Due to this version being completely free due to the promotion of E-Sports, Nations helped Stadium become the most popular environment in the entire series. TrackMania Nations ESWC was updated in 2008 to TrackMania Nations Forever in 2008 with the ESWC content removed. This game is the best one of the TrackMania series. United is a compilation of Original, Sunrise and Nations all in one title released in 2007. Besides the seven environments this game included more blocks for the existing environments as well as updating the skins of the vehicles of the Sunrise and Nations cars. This game is the most popular paid version of the series. This has been updated to TrackMania United Forever in 2008. Example of the updated skins from Nations ESWC (right) to Nations Forever (left). This was an update to both United and Nations in 2008 that updated Nations to use the United skins and blocks as well as allowing people who owned United to play multiplayer with people who owned Nations on the Stadium environment. All versions of United and Nations have been updated to this version for free. In addition to the Forever update a Stars expansion was released for both titles which included tracks from the various environments as an additional campaign for free. TrackMania2 is the latest of the TrackMania series with a brand new graphics engine and improved visuals as well as having cosmetic car damage for the first time. As of 2014 there are three games in the TrackMania2 series. TrackMania2 Canyon is the first of the TrackMania2 series released in 2011. 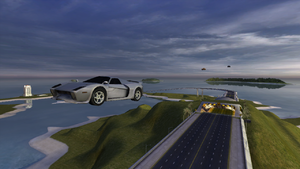 It is similar to the Desert environment in TrackMania Original/United except the older musclecars with stiff suspension are now replaced by Mustang like cars with a tendency to drift around corners. It includes new blocks and is sold as a standalone environment. 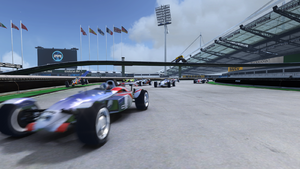 TrackMania2 Stadium is a copy of the Stadium environment from Nations/United with the new graphics engine released in 2013. Sold as a standalone environment this finally added underground blocks to the Stadium environment. TrackMania2 Valley is a remake of the Rally environment from TrackMania released in 2013 with Mini Coopers driving through the European countryside. It has handling similar to the Coast cars from Sunrise however it has a lot more blocks available to make high flying tracks with than Rally did. This page was last modified on 21 January 2015, at 13:17.